The name TED BAKER should ring a bell to most of us bloggers. In the beauty world, we all obsessed over those beautiful washbags in the spring/summer. Winter came along and it wasn't the washbags that caught my eye but instead it was the glamorous Rose Gold Hardware detailing on their recent purses. You can say I fell in love straight away. I got the chance to choose one as a Birthday Present and This Particular purse goes by the name of TITIANA, the Patent Matinee Purse that retails for £75 in Light Pink. As you can tell by the pictures, It yells and screams my name. It's milkshake pink mixed in with green mint is just up my street and to top that, it's finished with Rose Gold Hardware. What I really liked about this particular purse was that it can be wiped clean if gotten messy or if something did spill on it, it wouldn't damage easily. When opened you have a 4 credit card compartment followed by the coin purse and two lined compartments for money and notes. Mirrored to that you then have an additional 8 credit card compartments and a plastic sleeve to add family pictures or even leave the ted baker card in there (as pictured). 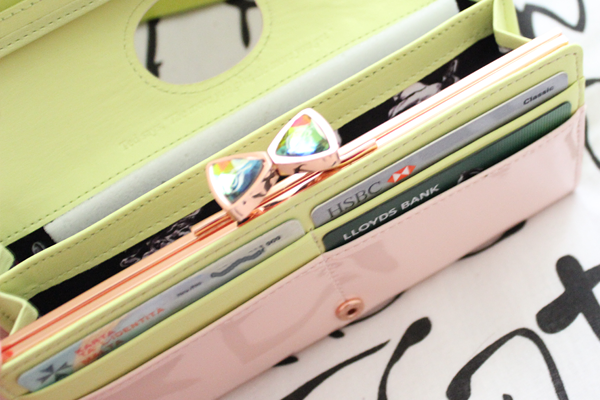 At the back of the purse is a zip where you can keep loose change or even notes or receipts that you might need to hold on to later on. All in all, it is such a wonderful purse and one i'll cherish and hold onto. I am very picky when it comes to purses, I have only actually used maybe 3 or 4 and my last Jasper Conran purse i've used for the past 3 years is on it's last legs and so it was time for a change! This may be my most expensive purse I have yet to own and I am truly grateful. SHARE YOUR THOUGHTS AND LET ME KNOW IN THE COMMENTS!